1. When you are logged into your Hubtel account, click on your profile icon at the top right corner of the page. 2. Select My Profile from the drop-down list. 3. 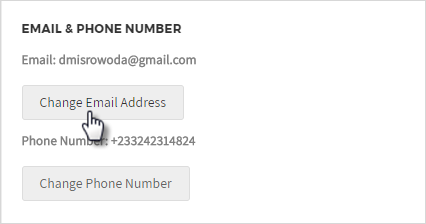 Click the Change email address button in the Email & Phone Number section. 4. Enter your new email address and your current password so that we can confirm that it is really you. And then click Continue. 5. A verification code will be sent to your new email address. Enter this verification code on the confirmation page and click Continue to finish changing your email address.